Wrong attributions may seem just silly. But they arent irrelevant  even if they are not deliberate cheats. There is a change in perspective when a thought or an opinion is perceived as coming from a different source. It can be interesting to find that something sounding modern was said or written, with the same meaning, three hundred or three thousand years ago  or something that seems traditional is actually quite recent. Or to notice the differences, or similarities, in sayings originated in other, close or remote, environments. Or to discover that ancient (or recent) nonsense (or lies) are being broadly and endlessly repeated without ever checking if they make any sense. A dirty trick, when there is a disagreement, is to attribute to opponents something they never said  placing them in the uncomfortable position of having to deny it. Historians are busy trying to sort out problems of this kind. I discovered only recently an interesting book published by the Oxford University Press in 1989. 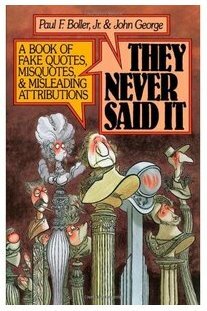 They Never Said It by Paul Boller and John George. Of course it isnt a complete collection. It would need a large number of researchers, for I wonder how many generations, to find a large enough number of misquotes to get close to everything. Paul Boller and John George asked readers to contribute examples, but they dont seem to have received many  in twentyfour years there hasnt been an updated or expanded edition. All this can be perceived as funny. I hope readers will find it amusing. But, as we shall see, the problem isnt a joke. A peculiar case is the often quoted irony «there are lies, bloody lies, and statistics». Its usually attributed to Benjamin Disraeli. But also Boller and George agree that it was written by Mark Twain, who mischievously reported it as said by Disraeli, while no trace can be found that he ever did. Looking into such a complex little story may seem uselessly meticulous. But it isnt. The meaning of a statement can, and should, be perceived differently according to the identity, style and mood of the author. I have some personal experiences with wrong attributions. There are several cases (probably many more than I know) of something I said or wrote being attributed to someone else. As well as parts of my books or articles copied without quoting the source. I am not complaining. I am much more interested in understanding if and why someone appreciates (or not) my work than fussing about authorship or copyright. It happens also the other way round: attributing to me someone elses words  or other sorts of things that I never said. Its irritating when these are opinions that I dont share. But I have no time to waste chasing forgers, people with confused memories or any sort of muddlers. After this personal digression, lets see some interesting examples as reported by Paul Boller and John George. Starting with some arithmetic. This is the number of incorrect attributions explained in their book, listed by author. Abraham Lincoln 28. Vladimir Ilych Lenin 24. Sam Godwin 19. George Washington 7. The Bible 7. Mark Twain 5. Josef Stalin 4. Nikita Krushev 4. Andrew Jackson 3. Its surprising that there are only two each for Thomas Jefferson, Napoleon Bonaparte and George Bernard Shaw, one for Voltaire and Groucho Marx, none for Albert Einsten, Karl Marx and Oscar Wilde  eight often misquoted authors. Only one of my compatriots, Galileo, is quoted in this book. According to the sources verified by the authors, he never whispered «eppur si muove» (and yet it moves). This vastly quoted murmur about Earth revolving around the Sun was attributed to Galileo, a hundred and twenty years after his death, by Augustin Simon Irailh in Querelles littéraires. Paul Boller and John George correctly observe that, even if he never uttered them, those words «surely represented Galileos firm belief». One of the most quoted sentences of all times is «sils nont pas de pain, quils mangent de la brioche». It wasnt said by Marie Antoinette, the queen of France guillotined on October 16, 1793. It was an anecdote in Jean-Jacques Rousseaus Les confessions (1778, eleven years before the French Revolution). Even then, the bread and cake remark was old folklore. The great princess mentioned in Rousseaus gossip may perhaps be identified as Marie Thérèse, the first wife of Louis XIV  or the empress of Austria by the same name. In a turbulent period, such as a revolution, false quotations proliferate easily. In one case the attribution may be correct, but its misunderstood. Before we get to Louis XVIs alleged comment, lets step one Louis back. This misleading attribution is not reported by Paul Boller and John George. But the fact is that the famous deluge comment wasnt uttered by Louis XV. His bright and powerful mistress, Madame de Pompadour, said to the king «après nous, le déluge». She didnt need any prophetic talent to understand that a very dangerous storm was brewing. Louis XVI was tragically absentminded in not understanding the impending problems. But there are many nonsensical comments about a note in his diary. «Nothing new today» on July 14, 1789. We are not sure that he actually wrote it. But, anyhow, it was true. The storming of the Bastille, still now a national holiday in France, was a negligibly small event (seven prisoners easily freed, nobody hurt) compared to the conflicts that had already developed and were going to get seriously worse a while later. (The Marseillaise was composed by Claude Joseph Rouget de Lisle on April 26, 1792). In July 1793 what was supposed to be the enlightened triumph of Reason turned into a hideous bloodbath called The Reign of Terror, with revolutionary dictators passionately killing each other and lots of other people  and crowds enthusiastically applauding the daily public performance of the guillotine. A year later, in August 1794, came a somewhat milder regime, called Thermidor. In 1799 the Napoleon dictatorship  turned into empire in 1804. After the huge bloodshed of ferocious wars, in 1814 the restoration of the old monarchy. Then more revolutions, more wars, and a second empire. The first durable republic in France was installed eighty years after the tiny storming of the Bastille. Lets get back to the examples in They Never Said It  on a lighter, but quite interesting, subject. Even more so than «tomorrow is another day» in Gone With The Wind, the most quoted sentence in the history of cinema is «play it again, Sam» in Casablanca. Paul Boller and John George explain that it isnt so. I have re-viewed the end of the movie: they are right. The real words are «Play it, Sam, play As time goes by». Said by Ilsa Lund (Ingrid Bergman), not by Rick Blaine (Humphrey Bogart). And Sam (Dooley Wison) doesnt only play it. He sings it again, for the sadly last time. Its an apparently small, but subtly relevant, difference in a masterpiece cleverly permeated by intentional and intriguing ambiguities. There is a case in which the most popular and simple quote, just one five letter word, may be right. While the high-sounding version is wrong. General Pierre Jacques Etienne Cambronne was captured, but not killed, at Waterloo in 1815. According to a journalist named Rougement, who had a gift for phrase making, Cambronne exclaimed: «La Garde meurt et ne se rend pas» (The Guard dies and does not surrender). For the rest of his life, Cambronne always denied having said such solemn words. Its much more likely that all he said was «merde». But the fake official statement is the one engraved on his monument in Nantes. The widely quoted statement «I disapprove of what you say, but I will defend to the death your right to say it» is found in a book published in 1906, 128 years after Voltaires death. The Friends of Voltaire by S. G. Tallentyre, pseudonym of Beatrice Evelyn Hall. Her source was De lesprit by Claude Adrien Helvétius (1758). From what we know of Voltaires attitude and behavior, its unlikely that he would have been very willing to actually risk his life in an effort to protect Helvétius, or anyone else, from censorship and persecution. Many (mostly not famous) people have been, and some still are, really and bravely doing it  quite often not even fully realizing the importance of their role. But there is no indication that anyone ever said it. Nazi potentate Hermann Göring was horribly capable of thinking something like «whenever I hear the word culture, I reach for my revolver.» (While he collected works of art stolen by his troops). But he is not the one who said it. It was written by Hanns Johst in his disgusting play Schlageter in 1933, when Adolf Hitler seized power. Regardless of attribution reliability, many examples reveal the stupidity of power (for the reasons explained in chapter 10 of The Power of Stupidity). For instance a Louis of France prior to the two that I have quoted: The Sun King, Louis XIV. Boller and George explain why there is no evidence that he actually said «létat cest moi», I am the state. But they comment that «he certainly believed the words attributed to him». There are several people and cliques, in power nowadays, suffering from the same delusion as Louis XIV. It remains to be seen how and when they will fall. And if they will be replaced by freedom or by other perverse dictatorships, oligarchies, intrigue, corruption, sneaky powermongering or violent conflicts. An interesting case of misquoting, explained by Boller and George, is a peculiar distortion of what Neil Armstrong said when he set foot on the Moon on July 20, 1969. Carefully chosen words to define the meaning of the event. It shows how the tiny detail of omitting a one-letter word can warp the meaning of a whole sentence. The attribution is correct. Neil Armstrong really said «thats a small step for a man, a giant leap for mankind». But the text is extensively quoted with an insidious mistake. Someone, in the hasty excitement of the moment, quoted his words omitting the a between for and man  creating a serious conceptual problem, that strangely went unnoticed until Neil Armstrong came back from the mission and pointed out the mistake. The correction was promptly reported by newspapers and broadcasting. But, fourtyfour years later, the faulty version is still widely spread. This may seem a harmless detail, but it isnt. There are many cases in which an apparently small detail produces an enormous proliferation of idiocies. None of which are irrelevant  and several can be quite dangerous. Its a known fact, though too often ignored, that displacing (or omitting) a single comma can change the whole meaning of a sentence. There are quite relevant debates, continuing for centuries, on the the understanding of classics depending on assumed punctuation. Divulgation of knowledge, explained so that non-specialist readers or listeners can understand it, is a vitally important cultural service. Unfortunately its often done poorly, by people who dont understand what they are talking abut, or dont know how to make it clear, or are shamefully inadequate in both ways. It happens in all fields  particularly confusing in science. Journalistic haste is often the cause of unreliable or overdramatized reporting. There are also cases in which the spreading of misinformation is intentional. Its a grotesque fabrication by creationists that Charles Darwin «repudiated his lifes work as he laid dying.» He never did, at that or any other time in his life. But the ambiguous fake quotation «I wish I had not expressed my theory of evolution as I have done», first concocted shortly after Darwins death in 1882, is still being obstinately repeated. However here is no lack of nonsense in the reporting of evolution facts or theories. I am astonished when I read or hear, with discomforting frequency, that man is descended from monkeys (or apes.) This was never stated by Darwin, or any other reliable scientist, for the simple reason that is isnt so. There are remarkable similarities between us and other primates, but we dont descend from them  nor do they from us. We are the result of different evolution paths, originating from complex, not yet thoroughly identified, genetic characteristics of earlier mammals. Some bones, recently discovered, appear to belong to primates halfway between humans and apes. Of course we can always learn from variations in evolution. But nothing suggests that these were our ancestors. It is more likely that they belonged to some other, now extinct, evolutionary lineage. An interesting fact, worth considering with keen attention, is that only one of several promordial human species has survived (though genes of other origin, e.g. Neanderthal, are found in our DNA, suggesting that probably there was cross breeding). An obvious deduction, that can help to expose the idiocy of the now few (but obstinate) racists, is that all now living humans belong to only one narrowly defined species. Of course solidarity, sympathy, empathy can and should extend across biological differences. But maybe the fact that we are all close relatives can help us to persuade those who dont understand. I must confess that I dont feel comfortable with too much sameness. Biological and cultural differences are useful, attractive and stimulating. This is a different subject, that maybe I shall consider in another context. The case of Jacques de Chabannes, Lord of La Palice, isnt mentioned by Boller and George. He did not say «if he wasnt dead he woud still be alive» and it isnt precisely true that anyone else said it about him. The explanation is peculiar, but quaintly beleivable. After winning many battles, Marshal La Palice was killed in the siege of Pavia (1525). His epitaph read «Sil nétait pas mort, il ferait encore envie» (If he werent dead, he would still be envied) and when this turned into a song the words changed because ferait envie sounds like serait en vie. This isnt as strange as it may seem. Lots of people around the world, now as thousands of years ago, sing or recite hymns, anthems, prayers, litanies, adages, axioms, truisms, aphorisms and all sorts of repetitive rituals without understanding the meaning of what they are saying. There are misquotes in images. Its hard to understand why so many quotations of the famous monologue are accompanied by pictures of Hamlet holding Yoricks skull, while that is another scene in Shakespeares tragedy. Or why authorities who were supposed to be familiar with the Bible, and not ignorant of physiology, approved pictures of Adam ad Eve with a navel. There are also non-verbal misleading fabrications. Such as the Piltdown Man hoax and several fake preserved bodies of baby dragons and other mythical creatures. Including swordfish bills exhibited as unicorn horns. Fake archaeological finds are quite abundant in all sorts of places. Such as a collection of Native American artifacts, excavated in Mississippi, oddly including an Egyptian mummy, that turned out to be made of papier mâché with a few animal rib bones thrown in to make it appear authentic. Of course there are many other examples. But, at least for the time being, I hope these are enough to understand the nature of the problem.